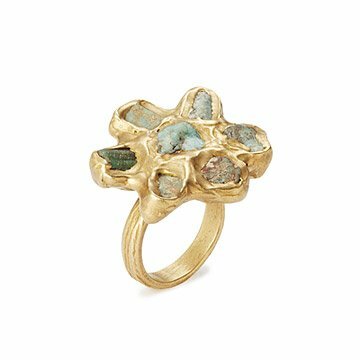 Emilie Shapiro's gleaming brass ring blooms with a bouquet of rough-hewn emeralds. Beautiful in a humble, honest way, her jewelry reflected her love for the real, the raw, and the authentic. Emilie Shapiro's gleaming brass ring blooms with a bouquet of rough-hewn emeralds. Plucked from the earth and unrefined, these hearty stones feature tawny marbling and vary in shade from creamy sea green to pale quartz. Handcrafted in New York City. Make it a set! Click here for the matching cuff.